Are you the parents who need to work long days or travel a lot? If “YES,” then to remain connected with your little one, a simple-to-operate, compact and portable baby monitor can be the best option. However, only a reliable travel baby monitor can ensure that you securely keep a watchful eye on your baby anytime when you need to step away for a moment. But finding the best baby monitor for travel in all aspects isn’t an easy task. The following list and review will help you a lot to find the right one to make your parenting easier. Here’s a glimpse of the five best travel baby monitor you can get. What You Should Look For In a Monitor for Travelling? If you’re looking for a complete video baby monitoring system, this is it. This monitor has everything to provide you the ultimate peace of mind while your little one sleeps and you spend a lot of time outside or another room. First of all, it offers you interference-free audio/video signal strength up to 1500 ft. So, you can keep tabs on your child from outside the home. Again, it comes with a 3.5 in color monitor that features a monochrome night vision camera. One of the advantages of this wall mounted camera is you can control it remotely. You can tilt, pan or zoom it right from the monitor to see your baby anytime. Moreover, you can expand the system up to four cameras., making it an ideal monitor for twins also. Another standout feature is its smart sensors. Its sound and motion sensor allows you to know whether your baby is awake or crying. Furthermore, the temperature sensor alerts you if baby’s room temperature goes below or above the range your set. Of course, it lets you customize the motion, sound, and temperature as you required. Also, it has a 2-way baby/ parent talk feature. Thus, you can listen or soothe your baby with noise reduction. Additionally, there are speakers and microphones in the video camera. Finally, its built-in rechargeable battery works up to 13 hours of standby time & 5 hours of continuous use. Handy to carry around monitor with a kickstand. Battery power lasts a long time. You can customize the alerts (sound & vibration). The monitor doesn’t have a beep or alert if signal is lost so it is harder to know if you have lost connection in the night. Here’s an excellent wireless video baby monitor from the popular brand Evoz. The unit is built with parents in mind and comes with all of the key features you’d hope to see. The first thing you would like is its HD wide-angle lens and IR LEDs that let you view your little one clearly from anywhere both day and night. Again, the unit is the iPhone and Android device compatible. So, you can watch your baby virtually from anyplace. What’s more, the camera software is completely secure as it offers you the full control of who is allowed to view the monitor. Data tracking and record keeping technology- that automatically collect room data and baby’s crying. It also allows the parents to set the schedule for sleep, changing and feedings. Graphical & raw data format export feature- let you easily share data with doctors. You have the option to access tailored parenting advice based on collected data patterns and child’s age. Cry detection patented technology- This feature distinguishes baby cries from other noises. And it also notifies you with email, SMS or push alerts. Not only that, when the cry is detected, the video monitor captures the image with night vision so that you can access it later. The best part of this product is you can conveniently access helpful parenting tips, tricks, and videos from your mobile device. Definitely, these tips will help you a bunch! With this fantastic unit, you can also soothe and calm your little one from anywhere by playing lullabies, music and even audiobooks. When it comes to design, this baby monitor comes with a sleek appearance, easy wall mounting system, and a stable base. It’s really a great product overall. Compact and easy to travel with & set up anywhere. Can handle everything direct from the phone. With the app you able to track baby’s feeding schedule, sleep, crying, etc. You can share the camera view with family member. The app is sometimes crashy. If you’re looking for the best audio baby monitor for travel, then this top-performing unit is here. What makes it so great is that it’s built specifically for parents who need to carry the parent unit everywhere without the hassle of holding it. Additionally, the compact size and belt clip on the parent unit makes it perfect for travel. The 160 feet indoor and 1000 feet outdoor operating range, and cordless feature is just perfect for the mom who travels frequently. Of course, the rechargeable unit let the parent unit to monitor your baby up to 18 hours on a single charge. Clear audio transmission- The digital audio technology also helps to eliminate the crackle of the analog models. Five-level sound indicator– It notifies you the baby’s cries from the other room. It’s definitely a great for peace of mind when you’re far away from your baby. 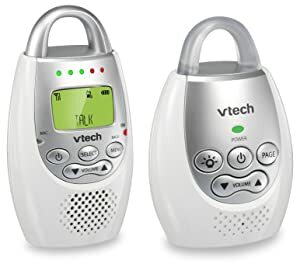 Vtech DM221 offers you clear sound along with better talk-back functionality than many video monitors available in the market. What’s more, the baby unit features a soft night-light for your baby room. Finally, don’t be a fool with its affordable price. Although it comes with a pocket-friendly price, you can rely on its quality. For various basic features like good battery life, cordless and reasonable price, this monitor easily beats out its many audio-only competitors too. Secure and crystal clear Transmission. Has a nightlight so you can feed your baby at night without any disturbance. Lightweight and portable parent unit. Some users complain that the battery doesn’t last long. 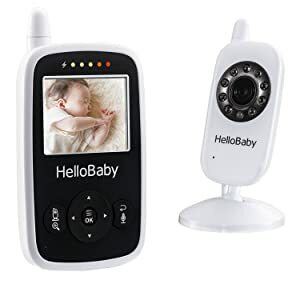 Hello Baby Wireless Video Baby Monitor can be one of the best picks to get through your working hours or full night with less stress and more relaxed. Not only is the Hello Baby monitor very affordable but it’s also the best video baby monitor for travel. Crystal Clear Day Video & night vision- This wireless video monitor enables you to keep an eye on your little one by providing a crystal clear image. Its automatic night vision allows you to see your baby overnight. Infrared LEDs- It automatically adjusts the light and transmits a clear white & black video even at the low light condition. 4GHZ wireless technology- This advanced feature offers up to 960ft without barriers and prevents signal drop out. Portable Handheld Monitor– let the parents move freely throughout the home and at the same time keep the baby in view. Two-way Talk – While your baby is crying, you can talk back to comfort him/ her. Sound Activated LEDs Indicator- When you have the volume turned down, this feature let you see the sound of your baby voice alerting. Screen off mode- This feature helps you reduce battery consumption up to 50%. You can turn on the display if you need to check your baby. Audio only mode- If you want, you can turn off the video and the audio-only mode still allow you to hear your baby. Its excellent parent unit is able to pair with up to 4 cameras. What’s more, this unit also features temperature monitoring and warning, optical pan and tilt, lullabies playing, and 2X digital zoom. Overall, to ensure the maximum comfort and safety, this unit is second to none. Some users complaint that the audio volume is quite low. 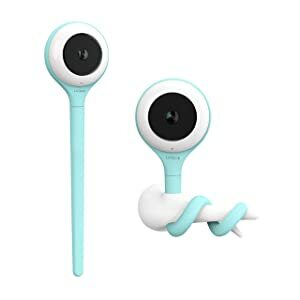 If you’re looking for something smart in place of the old-fashioned baby monitor, then this Lollipop Baby Camera is only for you. It’s a great looking, well-built Wi-Fi monitor that comes with tons of great features. In fact, it comes with unique Lollipop Camera design which is like giving candy to a baby. Additionally, it’s a high-quality, remarkable video monitor to check in on your baby properly. This unit is constructed of baby-safe, premium grade silicone and features high-quality, made-in-Japan lens. Moreover, it’s available in three cute colors. True Crying Detection- You’ll no more be frustrated by false alarm anymore. This unit is able to recognize 96% noise and real crying. Multiple Screen – You may control and view multiple lollipop monitors simultaneously. Unique Audio Mode & alarm system- Its audio mode let you monitor your baby overnight. It also alarms you when disconnected. It’s worth noting that, the unit is very easy to set up. You can attach it to the wall, secure it to the crib or stand it up on the flat surface. It comes with a built-in sound feature, so you can play classical music or calming white noise to soothe your little one. Finally, parents will also be benefitted from its other features such as live view, cross detection, data history, sharing, and event list. All in all, it’s pretty amazing how advanced this monitor has come. Clear camera to see baby during the day and night. Easy to move & can be place anywhere. Unlimited Live Feed watch time. No extra cloud service fee. Some parents have complained that the app is glitchy. We’ve done the hard work for you. But you still need to make some decisions on your own. This simple guide will explain what you should look for in the best baby monitor for travelling before making that final purchase. One of the main factors to consider while buying a baby monitor for travel is the range. In fact, it’s the biggest concerns for parents that the monitor is going out of range. If you need to spend a lot of time outside or have a large home, consider a long-range monitor. The second important factor is the size of the unit. If you travel a lot, heavy and large size unit can be difficult to move. So, a compact, lightweight and portable baby monitor may be the best choice for you. This factor determines how long you can carry the unit around before having to plug it in to charge. Battery life declines over time, and this is a common problem among baby monitors. So, traveller parents should emphasize on this issue. However, the audio-only mode is a great option to prolong battery life. Besides basic functionality, some models also come with extra features. Talk-back, night light, smartphone access, Wi fi capabilities are some of them. These additional features will definitely help you to make your parenting easier. Undoubtedly, a travel- friendly video monitor is the best choice over an audio-only baby monitor for busy parents, but video monitors come with a higher price tag. On the otherhand, cheap video monitors tend to be very low quality. If you’re on a limited budget, well-built audio- only monitor can be the best value for you. All the above-reviewed best baby monitor for travel will not only give your little one the best care possible but also give you peace of mind. So, picking the winner from the list was tough. 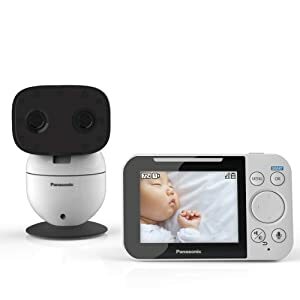 However, considering all the features and price, we’ve concluded that Panasonic Video Baby Monitor is the best baby monitor overall. Why do we say so…? Well, you can use this unit both indoors and outdoors without any trouble. It comes with an impressive long range and long battery life to let parents live their lives and still know their little one is safe and content. Considering all the features that this baby monitor has to offer, can you really afford not to acquire this unit? No more worry! Pick any of the listed best travel baby monitor! Go out and still check in on your baby properly.